Standing the test of time, the architecture of the Renaissance invokes a sense of grandeur and majesty. John Bensalhia looks at both the influence and the legacy of this era. Some of the most iconic buildings in the world can be traced back to the Renaissance. When it comes to looking to the inspiration of these marvellous Renaissance buildings, then it becomes a question of ‘chicken and egg’. In fact, the architects of the Renaissance in Italy looked to their own history – principally, the Classical Roman age. It's said that architects of the Renaissance age would study in great detail the ruins of old Classical Roman buildings such as the Colosseum or The Pantheon. A key aspect of buildings from this period is that they are built on a precise mathematical premise. Many examples of both Classical Roman architecture and Renaissance architecture are based on carefully studied and proportioned designs. The geometry, symmetry and proportion of Renaissance architecture is a key element, right down to the carefully arranged symmetry of the doors and windows – just like the ancient Roman buildings which were very much in tune with this concept. While Classical Roman buildings worked on the lines of simple mathematical ideals, subsequent Gothic buildings tended to be somewhat more flexible when it came to proportional rules and designs. So the new breed of Renaissance architects wanted to return to the glory days of Roman architecture, but also adding extra aesthetic sensibilities to the finished results. Many Renaissance architects would base their designs on the old Roman principle. Leon Battista Alberti's Tempio Malatestiano in Rimini and Church of Santa Maria Novella in Florence are said to be based on the Classical Roman design. 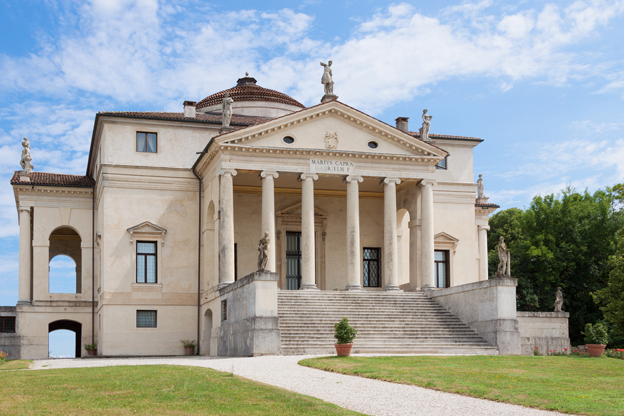 Andrea Palladio's domestic villas are also purported to be based on the ancient Roman way of structuring country villas - for example, Palladio's Villas Rotonda and Villa Emo. Other notable Palladio villas were Villa Cornaro and Villa Capra (with shades of the Pantheon in its four identical facades boasting a portico). Donato Bramante was another Renaissance architect who would influence his work with the Ancient Roman methods of design. For example, Bramante's Tempietto in the Cloister of San Pietro is said to be based on the style used for the Temple of Vesta, a highly sacred site in Ancient Rome. Bramante's near-central brick structured crossing for the abbey church of Santa Maria delle Grazie is also said to have been inspired by the old North Italian tradition of square domed baptisteries. One of the most notable aspects of Renaissance architecture is that of the dome. The usage of the dome in architecture is a two-way boon. On the one hand, it manages to roof smaller areas which can only be seen on the inside of a building – but at the same time, they are a vivid and bold structural feature of the building's exterior. A key champion of the dome was Filippo Brunelleschi. His first notable commission was that of producing the brick dome of the Florence Cathedral. The Cathedral had been the work of Arnolfo di Cambio, but it was still missing its roof. So, taking inspiration from the buildings of Ancient Rome (such as the dome of the Pantheon), Brunelleschi set to work. 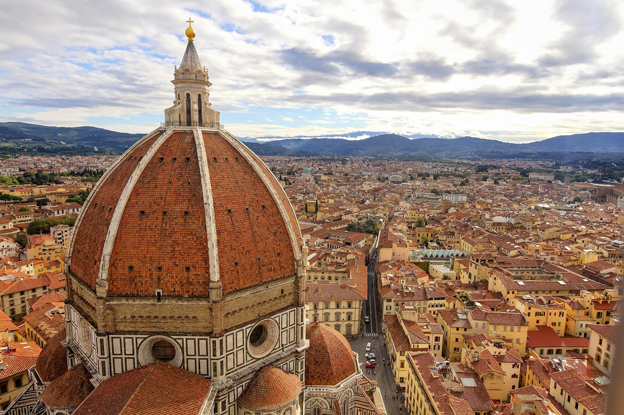 The Florence Cathedral Dome is arranged so that the main brick shell is held in place by eight large ribs and a further 16 internal ribs (with the shell of the dome comprising rectangular arrangement of the bricks). Another notable dome would be that of the dome of Michelangelo's work on St Peter's Library. In addition to Michelangelo redesigning the piers and walls, he also worked on the dome, which comprised two masonry shells with one shell inside the other one. Capping this off was a large lantern affair, giving the finished product a sumptuous, distinctive look. As ever, the Renaissance ethos was to be as distinctive as possible. The onus of Renaissance architecture wasn't just about following the crowd, but making one's own impression on the work. So, in Renaissance architecture, there are examples of stylistic flourishes and unusual quirks that make the finished results stand out from the crowd. It's also worth mentioning the trend that emerged during the end of the later period of the Renaissance, which puts a new spin on some of the challenging architectural projects. Mannerism, while still favouring the natural way of producing art, now introduced a new element. Mannerism wanted to inject a more creative and sophisticated way of producing art, so now there would be more unusual and artificial aspects to the finished results. The other side of the coin was whereas the earlier years of the Renaissance favoured balance and order, Mannerism injected a more clashing, unstable tone to the work. 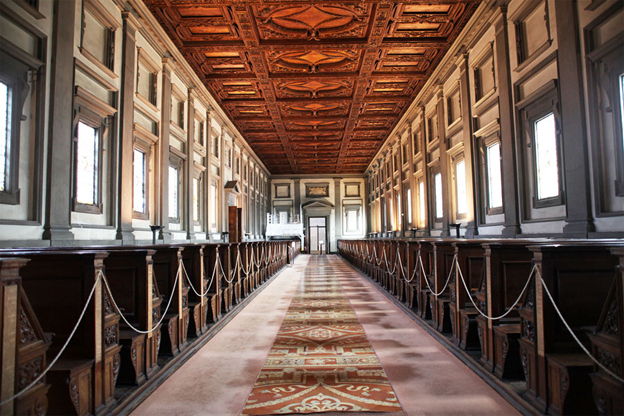 One of Michelangelo's best-known architectural pieces is that of the interior of the Laurentian Library in Florence. The interior is notable for both its quirky features and the contrasting aspects. Compare the lengthy and low outline of the upstairs library with the taller, thinner vestibule. While the library's low build may sound forbidding, the row of windows belies this, with the natural light coming through to give the library a light, warm feeling. An unusual but effective aspect of this Michelangelo work is the big staircase that almost spills out of the library. Another notable element of the stairs is that the middle rise of the stairs is steeper than the two bookending sides. It's said that the staircase was originally meant to be looked at as a sculpture rather than to be used by people – which would account for its unusual properties. Thanks to the creative vision, imagination and talent of the Renaissance architects, the buildings displayed not only strength and durability, but a sense of majesty. With wealthy families willing and able to spend money on commissioning luxurious abodes, the Renaissance was the era for opulent palaces and dwellings. 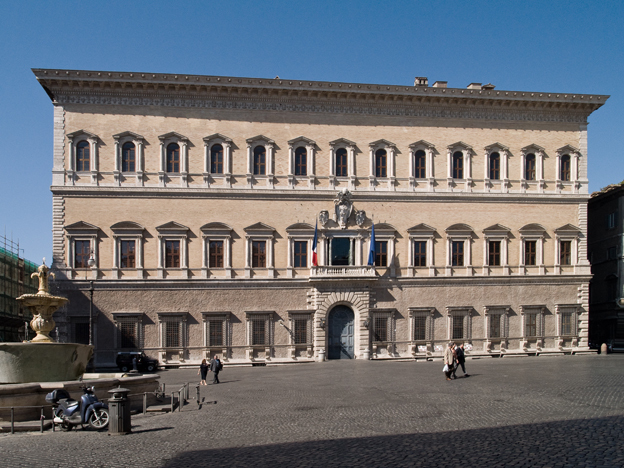 Palazzo Farnese is one such example – a project initially started by Antonio da Sangallo after he was commissioned by Cardinal Alessandro Farnese to not only restore but expand a small house from Augustinian monks of S. Maria del Popolo. However, because Sangallo passed away before the work could be completed, subsequent work on Palazzo Farnese was undertaken by Michelangelo, Vignola and Giacomo della Porta. It's arguably Michelangelo's brief spell on the project that produced the most breathtaking results – elements such as the added cornice, the new first floor gallery or the emphasis of the central storey with window and balcony added that extra sense of majesty and class. 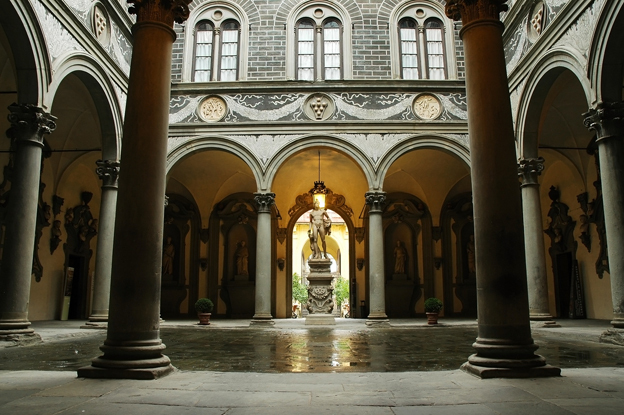 Michelozzo's Palazzo Medici-Riccardi is another example of architectural magnificence. It boasts beautifully decorated and detailed windows, rusticated floors, a distinctive cornice that crowns the roofline – not to mention the impressive courtyard and the Cappella dei Magi (Chapel of The Magi), which is said to be the oldest surviving chapel from a private Florentine palace. Alberti's work on the Church of Sant'Andrea also inspires a sense of awe and wonder – from the front of the building right through to the heart, there's a massive sense of scope. The imposing majesty of the front of the church again shows inspiration from the days of Ancient Rome – the Pantheon's influence can clearly be seen in the front of the Church. It also evokes the neat symmetry of the Renaissance, with the careful planning of the arch and the four pilasters. Inspiration from Ancient Roman buildings is also seen on the inside – both the side chapels and the huge central space are said to be reminiscent of the Basilica of Maxentius and Constantine.